Typically, women have a stronger interest in jewellery and design than men. The jewellery industry has also played a part – offering different accessories ranging from rings and bracelets, to statement necklaces and dangly earrings. Plus, these pieces are not just reserved for special occasions but for everyday use. Jewellery for men, on the other hand, has mainly stuck to chunky silver or golden chains, watches, subtle ear studs and plain rings. it’s safe to say the world of jewellery definitely caters more to women than men. Browsing through shops specialising in engagement rings and wedding bands, you will soon come to recognize that the emphasis here, clearly is on the brides-to-be! However, with positive changing attitudes towards the engagement process, the rise of more stylish offerings for men has been on the rise. Find out more in this blog post. Due to its similar looks, many people want to know the difference between white gold and platinum. 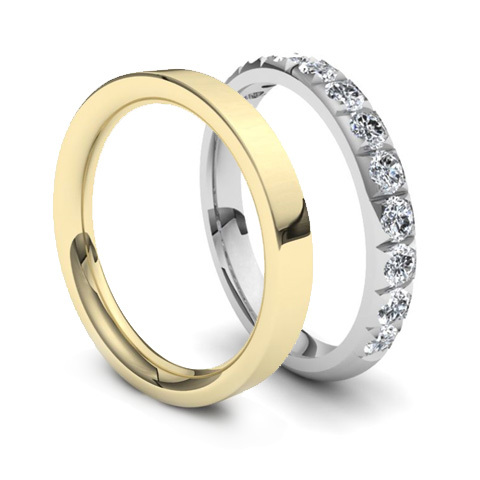 However, what is often an overlooked option between yellow and white gold. What is the difference between yellow gold and white gold? What is white gold made from? Which is better? Here’s an explanation of the differences, as well as the pros and cons of each. After investing in an engagement ring, many people would understandably want to maintain it’s pristine look for as long as possible. So here are our five ways to look after your ring! Diamond stud earrings are a versatile jewellery piece, made for both women and men and make great gifts for anniversaries. Not sure what to look for? Here’s our guide to what you should consider when buying diamond stud earrings. This is the final part of our series of guides to birthstones which gives an overview on October, November, and December. Birthstones are a fantastic way to add a special meaning to jewellery and make great gifts to mark a birthday, anniversary, graduation or other memorable occasions. They can be incorporated into rings, necklaces, pendants, bracelets and more. Paired with diamonds, they can add a splash of colour and variety to your jewellery piece. So read up on all the birthstones with our handy guide! This is part 3 from our series of guides to birthstones which gives an overview on July, August, September. To read part one click here. Birthstones are a fantastic way to add a special meaning to jewellery and make great gifts to mark a birthday, anniversary, graduation or other memorable occasion. They can be incorporated into rings, necklaces, pendants, bracelets and more. Paired with diamonds, they can add a splash of colour and variety to your jewellery piece. So read up on all the birthstones with our handy guide!